Cuffee has somewhat easier demographics than PPSD, but is pretty representative of the city as a whole. As you can see, they have good results across the board, very consistent, except 11th grade math. 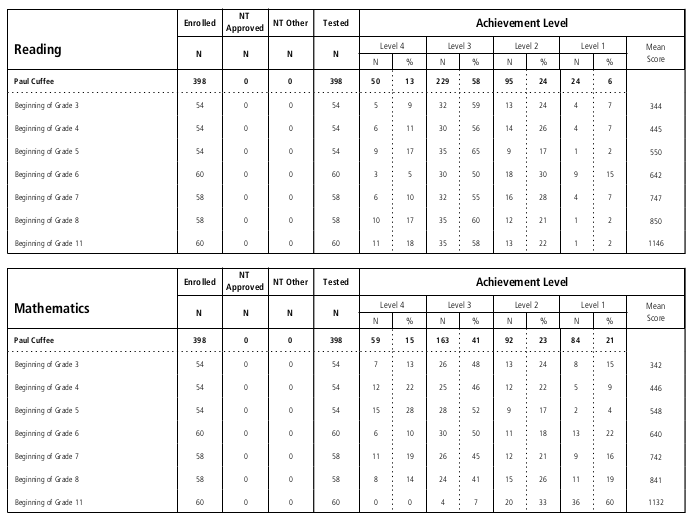 This is the high school's third year and their first 11th grade NECAP scores. While they've got 80% proficiency in 5th grade math and 76% proficiency in 11th grade reading, it is down to 7% for 11th grade math. 60% of Cuffee juniors are at risk of not graduating because of math. It isn't because of the union or lazy teachers with tenure. It isn't because they haven't had time to understand or adjust to the NECAP -- the test was well established when the school was started and the curriculum was designed. I believe most if not all their students were recruited from their middle school, so that should be a solid base of achievement coming in. They didn't have to recruit a whole host of math teachers; presumably just one per grade, for a well-regarded charter. If they can't find two or three good math teachers -- if that's actually the problem -- then... well, our "theory of change" is just broken. 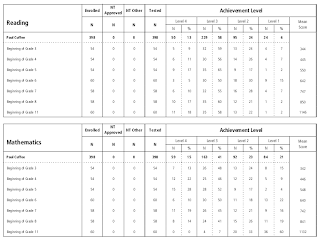 You can't claim that the school just doesn't understand "data-driven instruction" or "accountability" or whatever, because all their other scores are fine. Here's something else I noticed that has me scratching my head. The mean scaled score for Cuffee in 11th grade math is 1132, statewide it is 1135, but the difference in proficiency rates are 7% for Cuffee and 32% for the state. That seems like a pretty huge change in proficiency rate for a 3 point swing in scale score. This school's scores may be concentrated or more or less normally distributed. Statewide scores may be bimodal - a normal curve, or something close, centered near passing, and a large bump at the very bottom.